David Ward, Network Rail’s route managing director for the south-east, has been given an OBE for ‘services to the rail industry’ in the New Year honours list, the Guardian reported. […] Days before Christmas Ward was quoted in a Network Rail press release as saying the company’s new technology and working practices meant it could “keep lines open while our people work safely alongside, causing much less disruption than would otherwise be the case”. A second Network Rail executive, Patrick Hallgate, who oversees the western routes, received an MBE for services to the south-west economy. Before Christmas he asked passengers to “bear with us over the Christmas period as we undertake this extensive improvement work to create a better railway for passengers and those living near to the railway line”. The reduced volume of business and commuter travel demand has made Christmas a favoured time for Network Rail and its contractors to carry out infrastructure works on Britain’s railways. But following unplanned disruption on the East Coast and Great Western main lines after this year’s Christmas Day / St Stephen’s Day shutdown, the Office of Rail Regulation is to open an investigation into why trackwork was not completed on time, the Financial Times reported on December 28 (paywall). […] The [Network Rail] company apologised for the weekend’s disruption, which cancelled all services out of London’s King’s Cross station on Saturday, delayed services at Paddington and caused two-hour waits at nearby Finsbury Park, which was also closed temporarily because of overcrowding. “Network Rail, working with the rest of the industry, must learn lessons and prevent problems like this happening again,” said an ORR spokesman. The TSSA rail union called on the government to scrap the compensation scheme for rail companies, which saw them paid £172m by Network Rail for late trains while passengers only received £10m. About 60 per cent of Network Rail’s income comes from the Department for Transport, 27.8 per cent from track access charges paid by train operators, and 10.6 per cent from income from property and shops. It spent £36.2bn operating, renewing and maintaining the tracks in the five years between 2009 and 2014. The foul-up generated a large amount of unwelcome press and social media coverage, including articles in the Financial Times and Daily Mail. On 29 December, Network Rail’s chief executive Mark Carne, who was on holiday in Cornwall, made a statement. […] “While we have completed a huge amount of work across the country which will improve millions of journeys, the last few days for many passengers have been miserable and again I apologise for the disruption this caused. The track work outside King’s Cross has now been completed and we now move our focus to completing the other important projects over the New Year without any further unplanned disruption to passengers. “Following the problems experienced at King’s Cross and Paddington over Christmas, I have instructed Dr Francis Paonessa, who is the Network Rail infrastructure projects director, to provide a report into the sequence of events and associated decision making that led to the problems experienced and to advise any immediate steps that we need to take to increase the robustness of our works delivery capability. I expect the report by the end of next week and I intend to publish the findings. Also on 29 December, the Daily Telegraph reported that following a ‘public outcry’, Network Rail’s outgoing managing director of network operations, Robin Gisby, would be stripped of a £371,000 golden goodbye. In an interview he gave to BBC Radio 4’s The World At One, Mark Carne was evasive about who was responsible for the imbroglio, and whether he would be taking any of his bonus. But on the morning of 30 December, Mr Carne said he would not take it. Oddly enough, a picture of Kings Cross station adorned Network Rail’s online information about directors’ bonuses. […] Network Rail bosses are on track for bonuses worth thousands of pounds a year just days after the company was fined £53 million for poor punctuality and missing key targets. Unions reacted with fury after Network Rail’s ‘members’ – the equivalent of shareholders for a company that is a not-for-dividend firm – voted overwhelmingly in favour of a new bonus scheme for the top executives and prompting a new ‘fat cat’ pay row. The new bonus scheme is less generous than the old scheme it replaces. But chief executive Mark Carne and his fellow top bosses could still get up to 20 per cent of their annual salary in annual bonuses should performance targets be reached. The debacle is further evidence of the urgent need to reorganise Network Rail, overhaul its supervision arrangements, and reform the system of disruption payments to train operators. Neither the so-called members of Network Rail, nor the Office of Rail Regulation, have been able to bring the company up to standard. The most intensively used sections of the West Coast, Midland, and East Coast Main Lines are on the London approach. According to the Department for Transport, on a typical 2013 working day, around 3,200 passengers arrived at Euston in the morning high peak hour on Virgin Trains, and 32,000 over the course of the day. But there were another 10,000 high peak hour and 41,700 all-day arrivals on London Midland and Overground suburban trains. So, at the busiest time of the morning, three of every four rail travellers passing Camden roundhouse are on suburban trains. On the Midland Main Line, the proportion of peak ‘suburban’ travel into St Pancras is higher still. Much of the custom of ‘long distance’ East Midlands Trains is effectively outer suburban travel, to and from points which are not in the East Midlands. In essence, the figures indicate that investing huge amounts of cash in new-build high speed rail trackage is neither cost-effective nor justifiable on capacity grounds. The money would be much better spent on other projects. According to its website, Birmingham City Council needs “to make substantial cuts to services for the next financial year with pressures on finances expected to continue until at least until 2018”. […] This means planning for a future with a lot less money to spend on services for Birmingham’s citizens. Some services will need to change substantially, and some may need to be cut altogether. Although there may be a lot less money to spend on services for Birmingham’s citizens, the cash shortage evidently does not affect some other “services”. This month, the publicly-funded and council-linked Marketing Birmingham organisation announced it is looking to appoint a HS2 “Communications Projects Manager”. 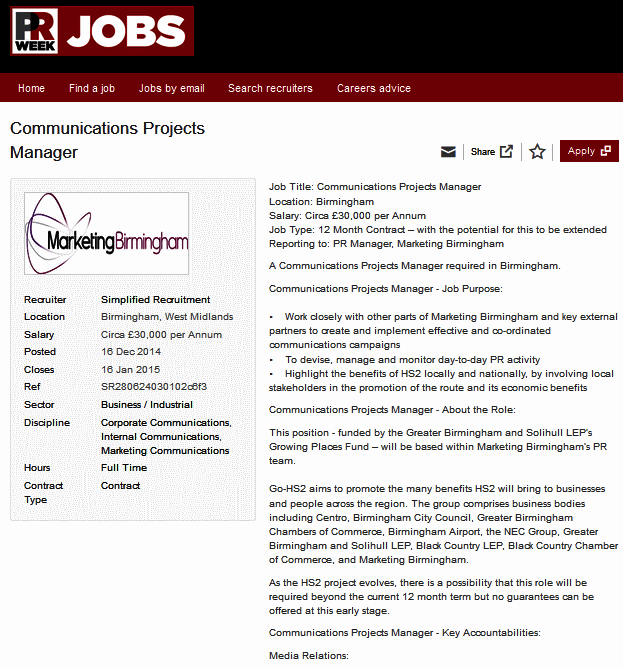 In April 2011, Marketing Birmingham advertised for a “temporary” Go-HS2 ‘Media Officer’, but that job was made quasi-permanent. Whether the December 2014 ‘Communications Projects Manager’ is an additional post, is unclear. At the time of writing, the most recent post on Go HS2’s website is called “Petitions seek maximum benefits from HS2”, which was posted on May 19, 2014. MPs have “hailed a breakthrough for Birmingham jobs after a Government committee chair called on HS2 to adjust plans for a train maintenance depot in Birmingham so that unwanted land can be freed up for development”, the Birmingham Post reported. Chairman Robert Syms MP said the HS2 bill select committee were impressed by the submission from AXA and Liam Byrne MP and sympathised with the need to address high unemployment in his constituency, but did not “believe” there is enough evidence justify siting the depot away from Washwood Heath. […] Hodge Hill MP Liam Byrne and his colleagues have long argued that the site is much too large for HS2’s needs and parts could be developed with warehousing or industrial units now – creating much needed jobs for the inner-city area in the medium term. By contrast, with construction of HS2 not set to begin until 2017 and the trains not running until 2026, it is argued that the delivery of jobs will take too long. Even then the RSMD would employ about 600 workers compared to thousands of opportunities which may be created by industrial development. And the Labour MP, who has campaigned with landowners AXA to release the site, has been backed by a Parliamentary Select Committee which, while confirming the site is ideal for the HS2 depot, has urged HS2 Ltd to ascertain it’s needs now and release any unwanted land for development as soon as possible. But Mr Byrne did not argue that the Washwood Heath site was much too large for HS2’s needs. He argued that the depot should not be located there at all. Mr Byrne has been outgunned and outmanoeuvred by MPs like Caroline Spelman (who do not want the depot on their patch) but is presenting defeat as a “breakthrough”. What exactly is ‘Washwood Heath Plan B’, and what is the difference in land take compared to HS2 Ltd’s previous proposal? The idea that HS2 Washwood Heath would create “thousands of skilled engineering jobs” is laughable. East Coast Trains has just 350 skilled and semi skilled depot staff — and that is for an old fleet which includes diesel trainsets (which are maintenance intensive). At this early stage, eight months into Network Rail’s current five year funding period [Control Period 5], the cost estimates of many of its programmes have not yet been determined, said rail minister Claire Perry on December 16. “At this early stage”? Great Western Main Line part-electrification was announced by Andrew Adonis on 23 July 2009. If its estimate has risen from £1 billion to £1.7 billion, that should be setting off alarm bells about the cost of HS2. The GWML wiring is only for 225 km/h linespeeds. HS2 electrification would need to be much beefier, to cope with its much higher train speeds, and much larger current draws. […] Recent figures released by the Department for Transport show that, while Northern carries just four per cent of all the passenger/kilometres [sic] on the whole national network, it is burdened with 12 per cent of the grant paid by Government to Network Rail, so on paper Northern has the highest subsidy of any operator.